Continuing on with my tale of beautiful Nepal, we set off for Chitwan National Park, where we would spend the next three days. Established in 1973, Chitwan National Park is the first national park in Nepal and was granted the status of World Heritage Site in 1984. The journey would take us 6 hours along the main route from Tibet and Kathmandu. Glued to the window of the bus, I found myself day-dreaming of the disparate lives of the Nepalese. Trucks, lorries, school buses, goats strapped to the roofs of moving vehicles, stray animals wandering down the main street, we see it all! We arrive at the Jungle Safari Resort. A quick refresh, no time to waste, then off for a ride on two oxen along the lumpy, bumpy tracks. 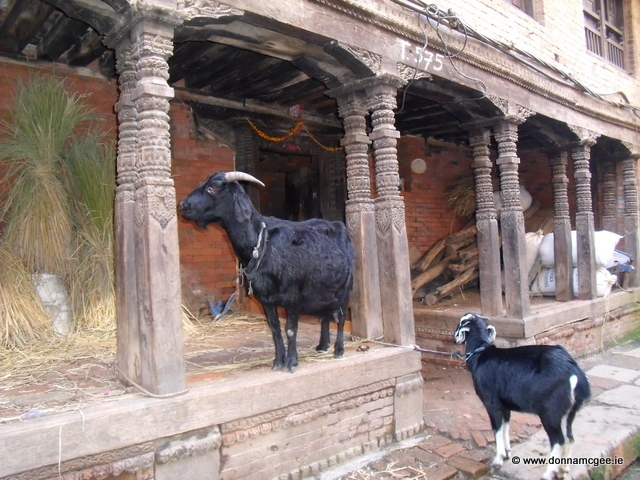 Local villagers look on with an air of curiosity – how different our lives are! We come upon the elephant breeding centre. This rural atmosphere seemed absolutely charming. Next morning, at 5.45 am we find ourselves canoeing on the Rapti River. There was low visibility and the air was cloaked with a mysterious, haunting, grey mist. The canoes crept along sleekly through the waters and led by officials from the National Park. We spot crocodiles along the bank – in the same water as us! – only a boat between us and them! Crocodiles basking along the bank and in the water alongside us!!! As we dismount from the canoes on the far bank the Guide points out the footprint of the Royal Bengal Tiger. It was an old footprint but enough to scare us all that we were now sharing the same land as these wild endangered species. We go for a long walk, carefully picking each step along the way. We study this terrain for signs of animal life. We stumble upon reindeer, monkeys and magnificent bird life. The Guide shares his binoculars with us as we pick out magnificent birds in flight and nesting along the banks of the river. We watch an old man with a herd of water buffalo pick a path across the river. You can tell, this is a man of nature, a man of much knowledge! We go on a jeep safari and encounter a rhino up close and personal but that’s another story! We visit Gharial Hatchery Farm where crocodiles are raised before being released into the wild. Later, we dine alfresco in the grounds of the hotel on a balmy evening. We enjoy the local dance with superb and graceful movement. The music sways us in unison with the brilliance of their striking and vivid costume. Next Next post: I wish I was a Gannet! Digital Media	Every day is a school day!